Jonathan Hickman and Dale Eaglesham’s critically acclaimed run continues in the Prime Elements, a story that kicks off the new world-spanning adventures of the Fantastic Four. Featuring the return of the Mole Man, the architecture of the underworld, and the smartest Moloid you’ll ever meet. Watch as the First Family journeys to the moon where they learn that the history of the Inhumans runs much deeper, and richer, than previously believed. 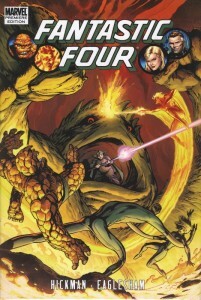 Collecting FANTASTIC FOUR #575-578. What’s that? Why yes, you are paying the same $20 for one less issue and 32 fewer pages in this volume compared to the last. At least these four issues are a cohesive story with no fill in creators. What we’re presented with is laying a groundwork for a future story. A hidden underground city built by the High Evolutionary is raised to the surface. A kingdom of fish people claiming to be Atlantis is discovered and Sue becomes their ambassador. The Inhumans call forth a gathering of other races mutated by the Kree to claim their place on Earth. There’s an attack in the Negative Zone. We’re given bits and pieces but need to wait for another volume to have it mean something. Interest is piqued and some great plot threads sewn but it’s disappointing to have to wait. Eaglesham’s art continues to shine: it’s clean, clear and concise. More facial expressions would be nice but that’s just me looking for something to critique. Some great pages here, like Galactus’ corpse, the Inhumans, Mole Man’s creatures. Lots of “fantastic” images abound and make this a truly larger than life series as it’s supposed to be. I don’t feel this volume is good value: fewer pages for the same money is always bad. Plus nothing is resolved in these stories, basically leading us into buying volume 3: here’s to hoping it’s worth it.